As part of the government’s Red Tape Challenge initiative to remove unnecessary burden, DVLA will no longer issue the paper counterpart to the photocard driving licence. This means that from today, existing paper counterparts will no longer be valid and should be destroyed. The photocard remains valid and should be kept safe. Since abolition of the counterpart was officially announced on 22 December 2014, the date ‘8 June’ has been etched in our minds as a destination point on a digital journey for the View Driving Licence and Share Driving Licence services. Our ‘agile’ daily stand ups have had a countdown visible for the last 80 days. Post-it notes have dwindled away, one by one, as dependencies needed for the project to meet its objectives have been ticked off. Numbers attending stand-ups increased as more departments came together, in readiness for the next major transition to digital. All our insight, planning, iterations and feedback from beta phases ensured that the new digital services have evolved to carry driving licence data securely. The View Driving Licence Service went Live in October 2014 and at that point had received over one million hits and still receives over 300,000 driver enquiries every month. Share Driving Licence, which moved into public beta on 19 May, has been developed to confirm a customer or employees eligibility to drive. This service provides real time digital access to a summary of the drivers DVLA record and is the digital alternative to the paper counterpart. With both services available to the public, the only task left to complete was to switch off production of the counterpart. We recognise how vital it was to have early and consistent engagement with you, our stakeholders, commercial customers and suppliers. 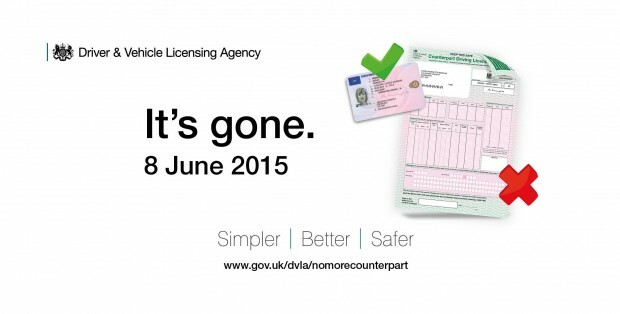 You’ve also helped DVLA deliver savings to the taxpayer of £17 million a year. If you still have any queries or want further information on any issue, please post a comment or email abolitionofcounterpart@dvla.gsi.gov.uk.